I GRADE MY RECORDS WITH THE FOLLOWING SCALE Grading Scale". Values are based on Jerry Osborne's Official Price Guide To Records, 2016 & 2017 Editions. POOR but below. 4 Better than. This LP is in excellent condition. RECORD IS EX - SLEEVE IS VG. Russal's Men Flatrock/Rehash 45rpm Square Dance Country Top Caller 25199 7"
SS: Still sealed in shrink wrap. EX: Excellent, clean copy with only a few light imperfections, possible minimal ring wear or corner wear. EX: Excellent, clean copy with only a few inconsequential flaws that do not affect play. Group Effort Sound - QCA Records # CC002. Scarce album by this Ohio group. Record has no visual defects - would grade EX ( using Goldmine grading standards ). The Pop-A-Tops Funny, How Time Slips Away/Mary Had A Little Lamb 45, RARE,EXC C! 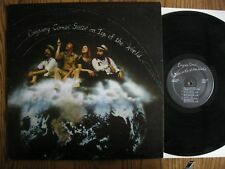 This vinyl is in EXCELLENT VG TO MINT- condition with the jacket in EXCELLENT VG CONDITION. NEAR MINT RECORD. WILL HAVE ALL ORIGINAL GLOSS, AT WORST POSSIBLY A LIGHT SURFACE SCUFF UP TO MINT UNPLAYED. Ex on vinyl, the record looks great and plays through beautifully. Overall nice album. TOP TEN RECORDS TTR-1001, Stereo. Beautiful LP from Martinsburg WV artist. Lot of 9 78rpm EP records on 1950s budget labels. All records grade about E, very little if any play. See photos for more details. Banjo Bonanza P2-11888 CBS 1973. 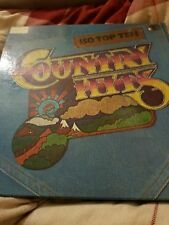 30 Big Hits including Dueling Banjos Double Album are in Excellent shape. 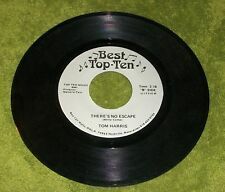 VTG 45 RECORD TOM HARRIS RODEO COWBOY WIFE THERES NO ESCAPE WATTS OK BEST TOP 10. NOTES: With Rodney Dillard, Ricky Skaggs, Burrito Brothers, Lacy J. Dalton. ARTIST : Earl Scruggs. LABEL : CBS Records. DATE : 1983. FORMAT : Long Play Record. THE WEAVERS, PROMO, DECCA #27515. ON TOP OF OLD SMOKEY / ACROSS..78 RPM,10", EX. This a very nice copy of Decca Promo #27515. It features The Weavers & Terry Gilkyson on both sides. The A side is On Top Of Old Smokey. The B side is Across The Wide Missouri The grade is EX. 1970 EXC. 1ST PRESS Carl Smith Little Crop Of Cotton Tops/ How I Love.... 45 7"
1970 EXC. ORIGINAL SLEEVE AND ALSO new mint generic sleeve(s). FIRST PRESSING EDITIONS ARE VERY VALUABLE, AND PROMO OR DEMO RECORDS ARE VERY RARE AS WELL; MANY OF MY RECORDS ARE FIRST PRESSINGS OR PROMO/DEMO/NOT FOR SALE SAMPLES. Top Rank Records; 19??. (#RM-334) -. VG = vinyl still has a great luster, record shows wear, surface scuffs. But the flaws will be noticeable to the naked eye. A virtually clean cover, but may have small writing on it.The artwork looks clean with slightly more aging. P = Poor or Rough condition. Can still be used for framing. Cover may have drill hole or tears, usually with heavy ring wear. EX or VG = minor scuffs which are only slightly visible. There may be more than a few scuffs and NO Scratches. Cover may have drill hole or tears, usually with heavy ring wear. VG = vinyl still has a great luster, record shows wear, surface scuffs. But the flaws will be noticeable to the naked eye. A virtually clean cover, but may have small writing on it.The artwork looks clean with slightly more aging. Vinyl =EX Cover =VG (In Shrink). Cover may have drill hole or tears, usually with heavy ring wear. VG = vinyl still has a great luster, record shows wear, surface scuffs. But the flaws will be noticeable to the naked eye. VARIOUS 16 Chart Hits Vol 6 - 1973 UK Vinyl LP, featuring re-recordings of 16 classic hits. Contour ‎2870-326. B4 Hell Raiser. A6 Broken Down Angel. Cover : Excellent. Record Condition : Excellent. B5 Bad Weather. Date: not dated, believed c1980. 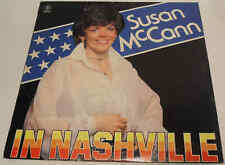 Title: Susan McCann in Nashville. Artist: Susan McCann. Label: Top Spin Records. MINT : Records described as mint should appear as new. There are no visible scratches, marks, scuffs (no matter how light). ALL THE SINGLES ARE FROM THE 1950'S AND 1960'S AND ALL THE RECORDS ARE IN EXCELLENT CONDITION. 1970 EXC. 1ST PRESS Carl Smith Little Crop Of Cotton Tops/ How I Love 45 7"
For double LP – count as 2 LP, for a box depends on the weight. ---REST OF THE WORLD: 1-2LP/12”, EP/10”, or 1-4 CD, or 1-6 cassettes. 5-8 LP/12”, EP/10”(up to 2kg)= 18.00 GBP. 3-4 LP/12”, EP/10”= 12.00 GBP.